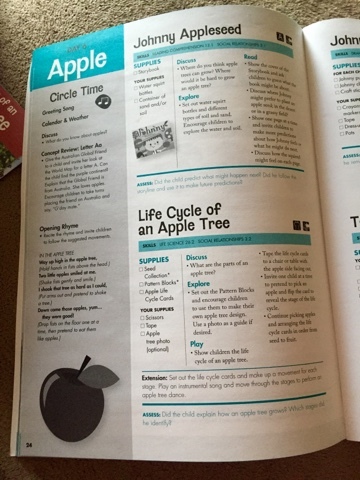 It hardly feels like Fall over here, but at least I have my Mother Goose Time Curriculum to help us pretend that it's Fall! 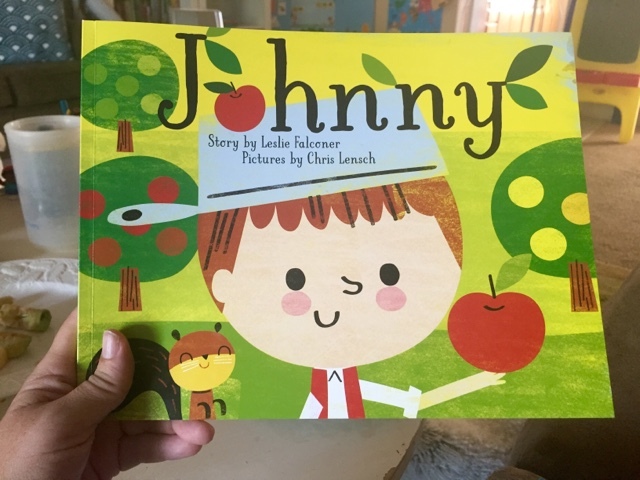 Allow me to wear my public school teacher hat for a bit: We are learning about different types of fruit trees this week during our "Into the Orchard" theme of this month. A very important thing to remember though, is that these themes are really just the vehicle to learn the important objectives in reading, writing, math, language, etc. 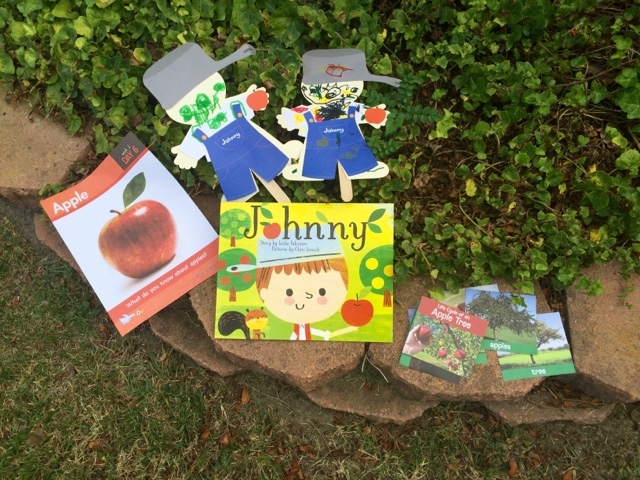 While it's very interesting for them to learn that seeds turn into saplings that turn into trees, it's more important (at least from an academic standpoint) that they learn reading comprehension skills while learning about the trees. That is something that truly stands out to me regarding the years that I spent teaching elementary school. One of the 3rd grade science standards was to learn about habitats, and while I did test them on these concepts, what I was really looking at was using the exciting subject matter to get them to write sentences, and then form those sentences into paragraphs. Now I will put on my homeschooling hat: Learning about these trees and seeds and nuts can possibly be just as important as Tiny B learning how to form the letter T and learning inferencing skills while reading. I feel like every teacher (homeschool, public school, private school) needs to be very careful about keeping the joy in learning. 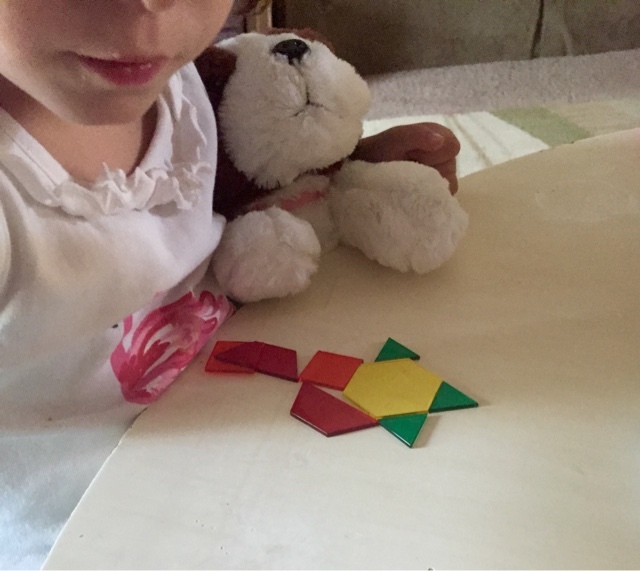 Tiny B and Strong B are not begging me to do Mother Goose Time because they are excited about the fact that they are learning how to sort and pattern (well, maybe a little bit). 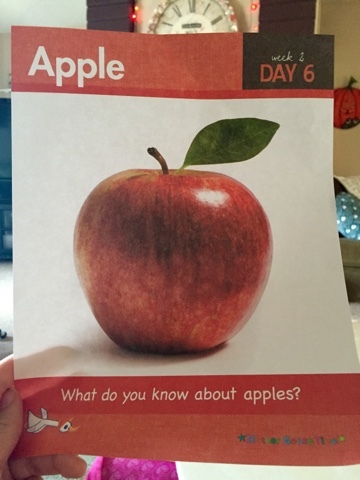 They are mostly excited about the fact that they are learning about APPLES! And apples are yummy! And they went to an apple orchard with mommy and daddy and they're going to go to a pumpkin patch next week! Honestly, I wear both hats and sometimes it really helps, and sometimes it holds me back. 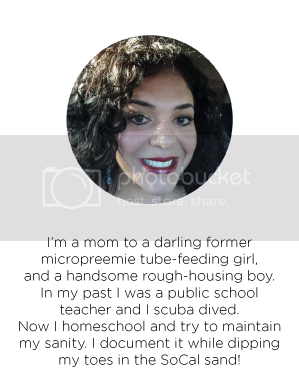 I'll explain that in an upcoming post about how being a former public school teacher affects my being a current homeschool mama. Now onwards to telling you about one day of lessons in which we learned many things! Every day looks different in my home regarding homeschool. My three year-old son attends an amazing preschool for nine hours a week. During this time I'm able to focus on more academic things with Tiny B. On this particular day, I saved all of my lessons to do with Strong B because he is an apple fanatic. Every day we begin with a greeting song, and today's song was about apple trees, of course. They learned the lyrics and we sang them several times. After this we used the pattern blocks that come with the curriculum, to make their own apple tree designs. (Of course, they had to have their own apples to eat as we enjoyed our activities. Watching them BOTH eat apples is heavenly to this tubie mama's heart). 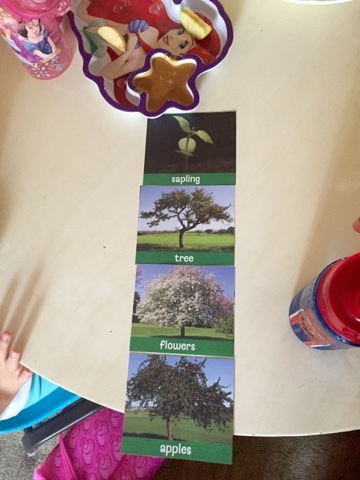 We then talked about the life cycle of a tree and I had them retell the information using the cards. We tasted our two different types of apples, Empire and Pippin, with our eyes closed. 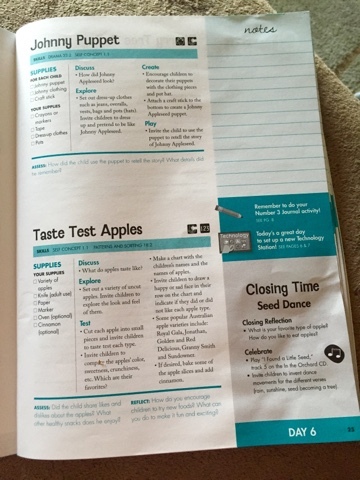 We described the different tastes and I introduced new vocabulary words such as tart and sour. We discussed our opinions regarding the two apples. *Please note that sometimes I just breeze through a book and I don't care one bit about different levels of questions...I'm only counting down the minutes until they're in bed! 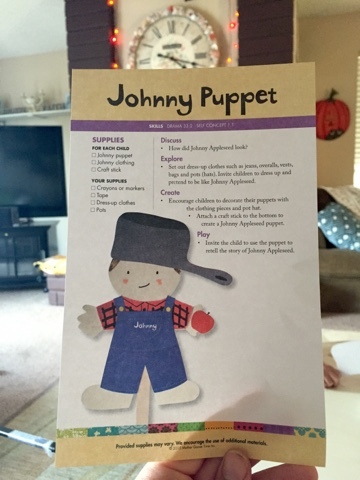 We then made Johnny puppets. Mother Goose Time has different types of art projects. Some are totally creative and open-ended and the child decides on what the final product will look like, where some are more based on the end product and what can be done with the products. I absolutely LOVE this about the curriculum because kids excel in different things, and both of these types of art projects are important! 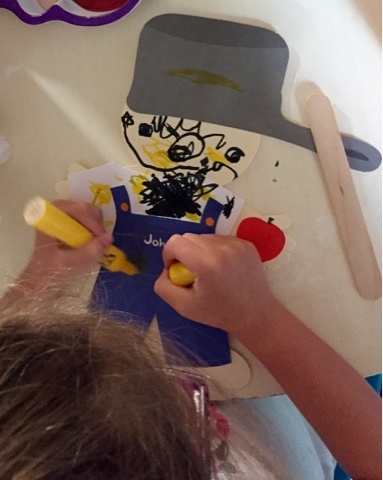 In this case, they of course glued and colored which allows them to practice their fine motor skills, but more importantly, they used the puppets to act out the story, first by listening to me retell it, and then by retelling it themselves. What a perfect way to work on reading comprehension, summarizing, and language acquisition in one task! A Pumpkin Patch Party with Mother Goose Time! 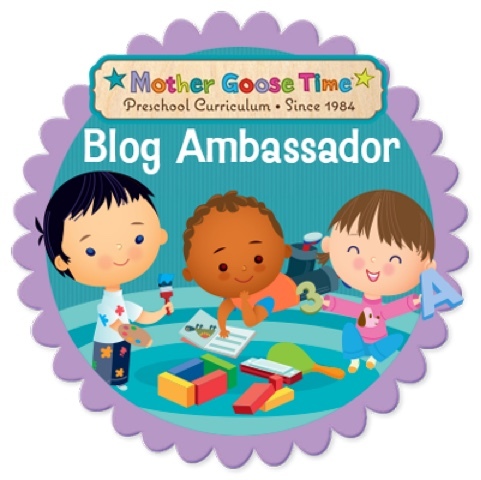 Into The Orchard with Mother Goose!